SPECIAL Korg Kronos SOUND BUNDLE PACK: Get all 15 of our incredible Kronos sound sets for only $399. 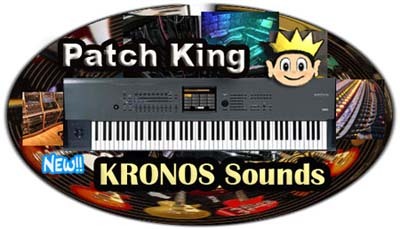 An amazing collection of sounds now available for the Korg Kronos – weighing in at: 832 Programs, 360 Combis, 10 Drum Kits, 32 Wave Sequences, 32 Guitar Loops and over 1.5 GB of New Samples! Get the complete package of Vintage Synths 1-3, Soundtrack Mix, Hit Factory, Sonix Bliss, Dark Energy, Electric Guitars 1, 2, 3, Wave Machine, Analog Sensation, EXi Super Synths & Electric Pianos & Classic Rock for the special low price of $399. USD – A $329. savings.